You might get the impression from reading this blog that the region of Galicia happens to be one of the most beautiful in Spain. It’s true, this northwest corner of the country is blessed with white-sands beaches, dramatic coastline, Roman ruins, and charming medieval town centers. Modern architecture from both the turn of the century and the early aughts adorns cities like A Coruña and Santiago de Compostela. And you’re never too far from well-kept-up public parks and the green countryside. But many of the rural areas that have quickly urbanized since the 1960s haven’t done so well when it comes to architectural design; in fact, many houses and apartment buildings look so terrible that a term has been coined to describe this subset of Galician architecture: feísmo, literally translated as “ugly-ism.” Feísmo embraces everything from a mish-mash of building materials, heights, and decorative styles from one house to the next, to exposed brick-and-concrete framing, and even simply unpainted walls left to decay in the moist, humid climate. When you compare villages like Ordes, an agricultural community halfway between Santiago and Coruña, with either of those two cities I just mentioned, the contrast is shocking…and “ugly-ism” begins to seem like it must have been the guiding architectural movement in such towns. 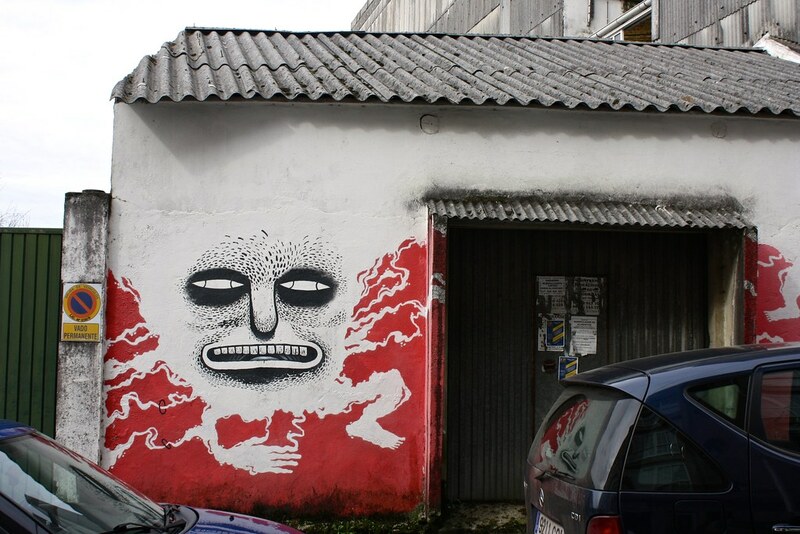 Enter DesOrdes Creativas, an international urban art festival now in its eighth year running. 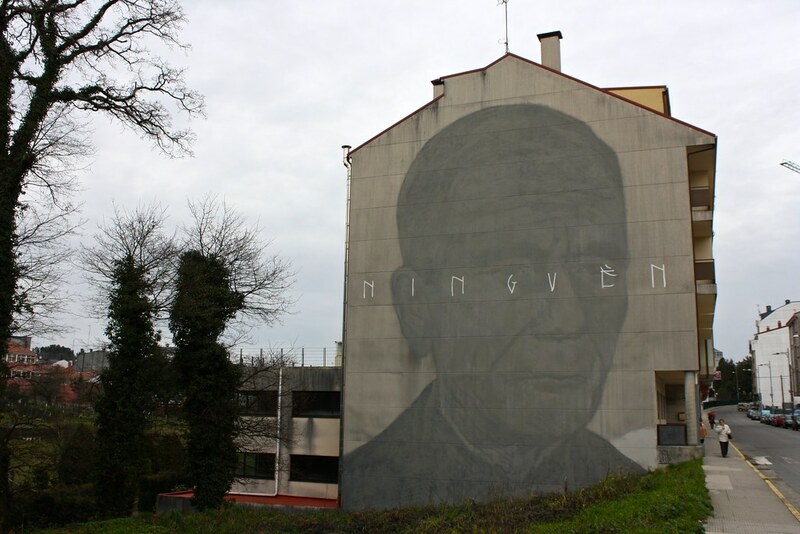 Riffing off of the town’s name (which means “orders” in Galician), “Creative Disorders” brings together local Galician street artists and prominent international ones, too, commissioning murals to spruce up stark, blank walls and to breathe new life into abandoned houses and bleak cityscapes. 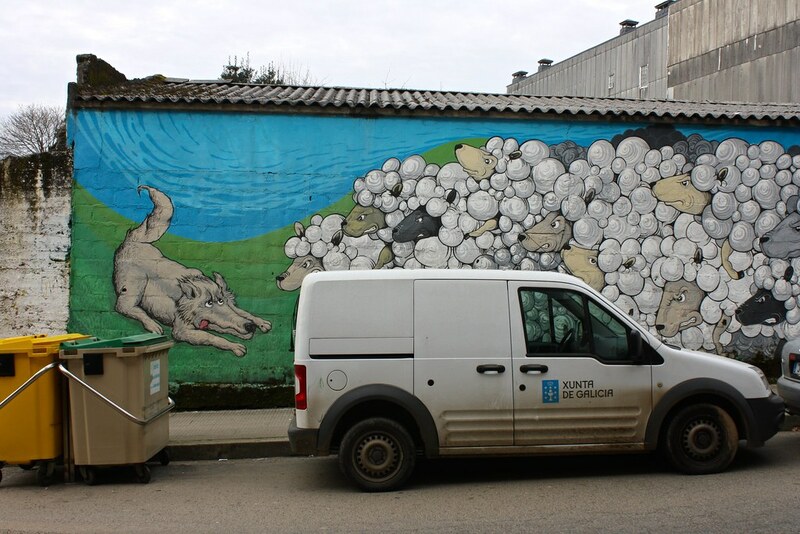 I think for the most part their efforts have been a success, although I wouldn’t have found half of the pieces simply wandering around town on my own; I had to specifically look for each mural using the map on DesOrdes’ website. Still, I enjoyed dashing across Ordes on a street-art treasure hunt, the sole camera-toting tourist to pass through town that day (or month?). Many of these murals are whimsical bursts of color that do their best to combat the gray ugliness of Ordes, but quite a few offer pointed political statements. The mural in embedded Instagram photo above portrays the Roman goddess Diana—the goddess of the hunt and the protector of the forest—shown taking care of forlorn wildlife as their habitat is engulfed in flames. 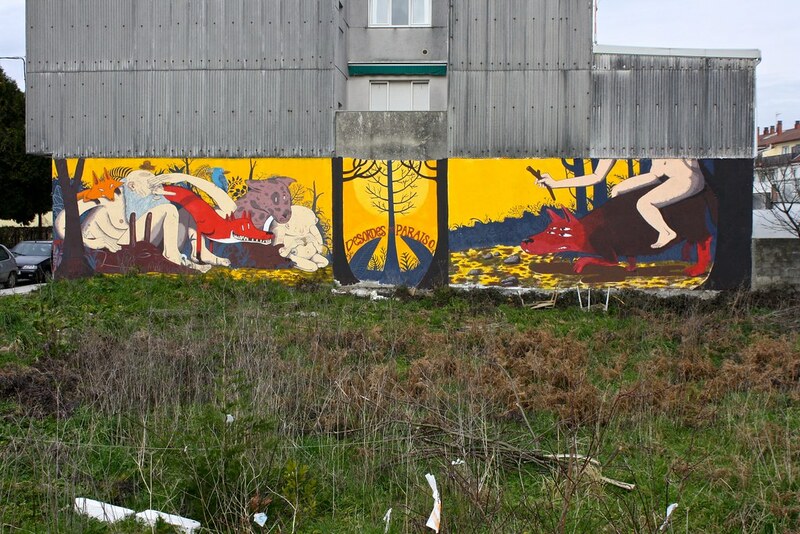 Several years ago the Fragas do Eume (a nearby national park) suffered a huge wildfire; the mural commemorates that event. In the above photo above, you can see all sorts of woodland creatures like frogs, toads, and mice raising up pitchforks, sickles, scythes, and torches to take on a crane wearing a crown. In case you can’t pick up on the imagery, it’s an allegory for the working classes of the proletariat (the creatures) rising up and uniting to take on the moneyed class and the bourgeoisie (the bird). 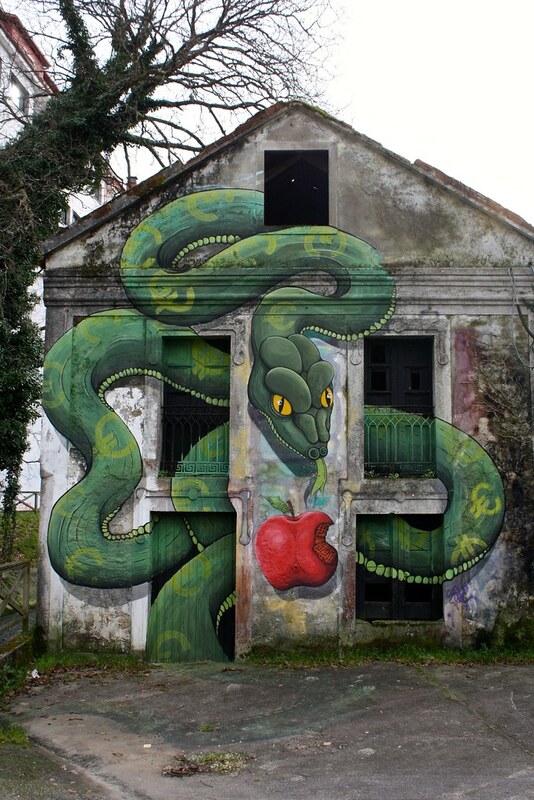 My favorite piece was this one below, entitled “Original Sin” and featuring a striking but sinister green python tattooed with Euro symbols. The key to the piece is the red apple with a bite taken of it, which reveals clay bricks, a common building material in Spain. As the website’s description explains, Spain’s “original sin” that got them into the financial crisis was giving in to an unsustainable housing bubble, represented by the half-eaten apple. The town of Ordes sits halfway between Santiago de Compostela and A Coruña and is served by 12 weekday buses in each direction run by Monbus and half that on the weekend. It’s a half-hour bus ride from both Santiago and Coruña, and it shouldn’t cost you more than 5€ for a round-trip ticket. 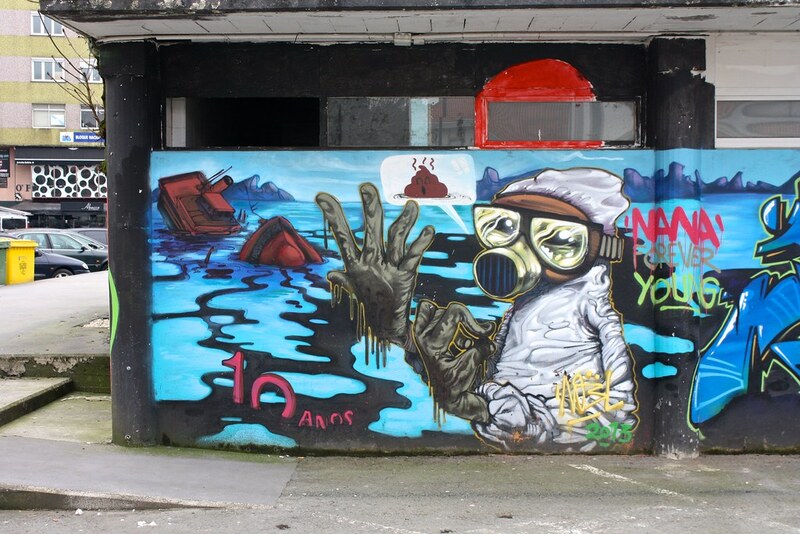 Make sure to scroll down to the end of this post for an embedded map with links to all the street art featured on here as well as many, many more murals. I had a delicious and super-affordable menú del día (fixed-price menu of the day) at Mesón do Pulpo Guindiboo, right across from a mural on the main drag, Rúa de Alfonso Senra, 73. If you’re planning on daytripping to Ordes it’s worth stopping off for a bite to eat here for some octopus or whatever’s on the menu that day! What was your favorite photo from this post? 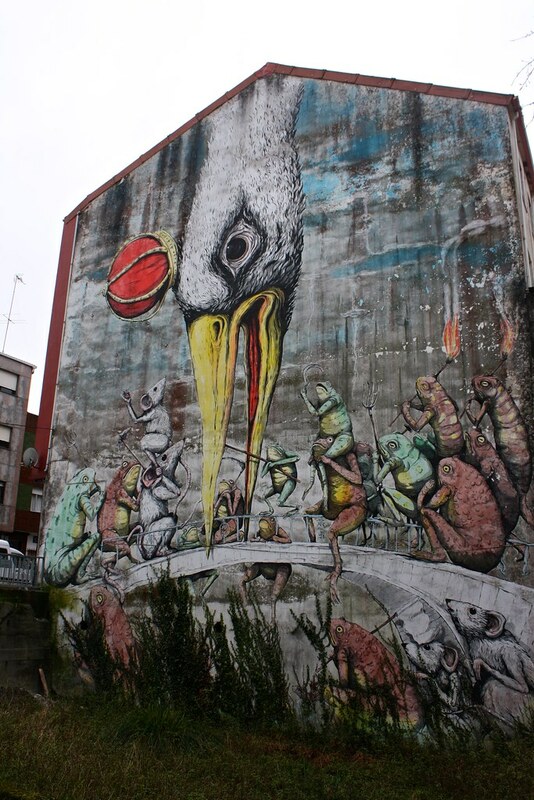 What’s your favorite destination for checking out street art? Share below in the comments section!